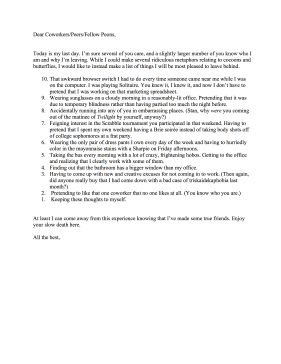 Written in a funny, teasing style, this workplace goodbye letter is addressed to coworkers. Today is my last day. I'm sure several of you care, and a slightly larger number of you know who I am and why I'm leaving. While I could make several ridiculous metaphors relating to cocoons and butterflies, I would like to instead make a list of things I will be most pleased to leave behind. 10. That awkward browser switch I had to do every time someone came near me while I was on the computer. I was playing Solitaire. You knew it, I knew it, and now I don't have to pretend that I was working on that marketing spreadsheet. 9. Wearing sunglasses on a cloudy morning in a reasonably-lit office. Pretending that it was due to temporary blindness rather than having partied too much the night before. 7. Feigning interest in the Scrabble tournament you participated in that weekend. Having to pretend that I spent my own weekend having a Brie soir�e instead of taking body shots off of college sophomores at a frat party. 6. Wearing the only pair of dress pants I own every day of the week and having to hurriedly color in the mayonnaise stains with a Sharpie on Friday afternoons. 5. Taking the bus every morning with a lot of crazy, frightening hobos. Getting to the office and realizing that I clearly work with some of them. 4. Finding out that the bathroom has a bigger window than my office. 1. Keeping these thoughts to myself. At least I can come away from this experience knowing that I've made some true friends. Enjoy your slow death here.